"Species such as these are a nightmare to the taxonomist, though when aspects of their biology other than taxonomy are considered they may have much to offer to general, and, in particular, to evolutionary studies." Cronk, Q.C.B. (1998) The ochlospecies concept. Ch. 11 in: Huxley, C.R., Lock, J.M. & Cutler, D.F. (eds.) 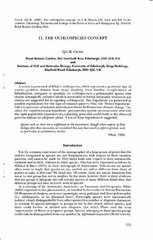 Chorology, Taxonomy and Ecology of the African and Madagascan Floras. Kew Bulletin Additional Series, HMSO. - for pdf click on the thumbnail below. ABSTRACT OF PAPER: A review is presented of White's ochlospecies, which represents a particular type of species problem distinct from those resulting from familiar complications of hybridisation, autogamy or apomixis. An ochlospecies is a polymorphic species with chaotic infraspecific variation which is intractable to formal taxonomic treatment; ten criteria are suggested for recognising ochlospecies. Two hypotheses are presented as possible explanations for this type of variation pattern. One, the 'Prance hypothesis', refers to processes of isolation and refusion driven by Pleistocene climatic change. The other, the 'rapid expansion hypothesis', proposes that genetic processes associated with the rapid population expansion of a colonising generalist could result in the observed patterns without an allopatric phase. A test of these hypotheses is suggested.